Ever since Foursquare split itself into two apps, it hasn’t been quite the same. That division, which spun the location check-in functionality off into a second app called "Swarm," was indeed controversial when it happened nearly two years ago, and the apps' download rankings took a dip. But in recent months, Foursquare has been ramping up its efforts to turn Swarm into something to which we can all get addicted. Swarm 4.0, which launched earlier today, puts a sharper focus on something Foursquare knows many of its users have always used its apps for: Lifelogging. The new app sports a redesigned profile tab that emphasizes your own check-in history (which is private) and makes it easier to learn from, thanks to Mint.com-style charts and a searchable map of personal check-ins. Last May, Foursquare brought back mayorships—the ability for users to become the "mayor" of places they check into the most and compete with friends—back into Swarm after removing the feature during the 2014 split of the apps. This, along with other game mechanics like earning coins and stickers (formerly "badges" in the old days of Foursquare), is intended to make Swarm a more engaging (read: addictive) app, while Foursquare proper continues as a geographically aware personal-recommendation app for places. So far, Swarm's efforts appear to be paying off: The app recently broke 8 million daily check-ins (in mid-2011, Foursquare was reporting an average of 3 million check-ins per day). 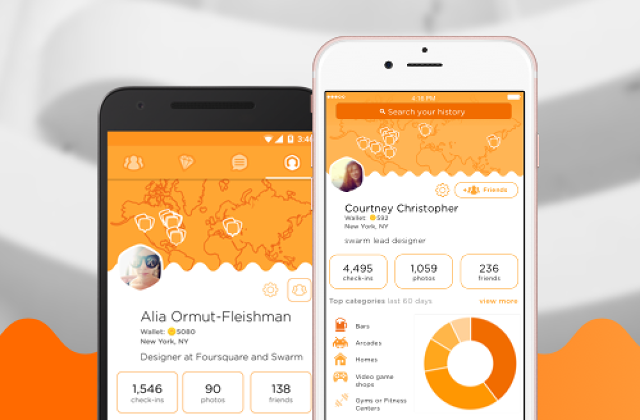 Now, in addition to helping us keep track of friends, Swarm wants to help us keep track of ourselves. As it turns out, habitually checking into every restaurant, cafe, bar, and gym you go to has a way of helping quantify your whereabouts over time. My number-one most-visited type of venue, for example, is coffee shops (which tend to double as an office for me). No surprise there. But, if I’m being honest, I would have expected pizza shops to rank more highly than they do (#5) and the fact that I’ve checked into more bookstores than music venues suggests I’m much less cool than I ever imagined. To be fair, my own usage of Swarm has ebbed and flowed since the app launched in mid-2014, so the picture isn’t as complete as it could be. As it turns out, I’m not alone. Though well-designed and useful, the new Swarm user profiles bravely put an unintentional spotlight on Swarm’s biggest problem: Its missing users. In the "Top Friends" section of my new profile, it shows me these people, in this order: First, my ex-girlfriend, whose last check-in was in 2013 (it’s okay, we’re friends now). Next, my friend Erica whose last check-in was in 2014, followed by my friend Dan—once the esteemed Foursquare mayor of our favorite Philadelphia dive bar, Oscar’s Tavern—who hasn’t checked in anywhere since 2013. Indeed, only two or three of the people on my top 10 friends are people I still see using Swarm with any regularity these days. That’s exactly one of the problems Foursquare is trying to solve here. Looking at the redesigned profiles, I get a nagging feeling: Wow, look at this map of places I’ve been since 2009. Check out these charts. I should really keep this going! I better start checking in more again. Achievement unlocked, Foursquare product team. Achievement unlocked.